Film & Media Arts International Academy is custom built for filmmakers and animators of the 21st Century. We are a film school and an art school firmly grounded in all the technical crafts needed to create digital content. FMA instructors are seasoned industry professionals with international experience. They share with the students their knowledge and experience to prepare them to excel in the professional world of filmmaking and animation. The heavy production schedule imposed on each student means a lot more hands-on learning when compared to other film schools. We are the best film school in Cebu City, Philippines, Asia. 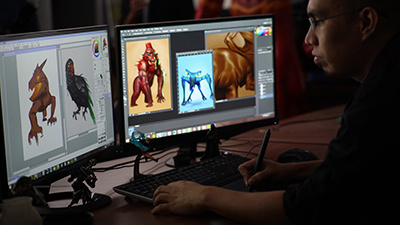 Most importantly, what sets FMA apart from other film and animation schools is the emphasis on students working on real-world projects like the TV series “Guardian Blade Legacy,” TV commercials, theatrical PSA’s, and documentaries. EDUCATION EFFICIENCY: One of the best aspects of FMA’s one-year Diploma program is that it allows students to get a compressed, immersive filmmaking education without being burdened by taking all the classes unrelated to their eventual profession that an Associate’s or Bachelor’s program requires. The compressed nature of the program allows FMA students to finish their education and get employment as soon as possible — much more quickly than those going through a four-year program. PROFESSIONAL EQUIPMENT: FMA has invested significantly to get the best equipment so that students can use cameras, audio gear, and lights that the industry is using. While other schools require you to shoot a movie on your own smartphone, we only teach on the tools that are being used in the industry at large, from DSLR to the RED Epic Dragon. TOP INSTRUCTORS: FMA has gathered a unique mix of local and international filmmakers to instruct the students on the latest techniques and styles. From New York to Hollywood to Hong Kong to Manila, our instructors have experience making movies around the globe, and bring that experience to the students. LOCATION: FMA is ideally located in the heart of Cebu City, a city on the rise teeming with economic growth, fine dining and nearby exotic travel destinations. Although the city has everything you expect from a first-world country, the cost of living is exceedingly low compared to other places. INDIVIDUAL ATTENTION: With small class sizes, our instructors are able to give students personalized attention and focus on the needs of the students. VALUE: On an international level, FMA’s one-year program gives the best value – the most hours with the best instructors for a surprisingly affordable price. Want to learn about our program?